DOE’s Home Energy Information Accelerator Advances Home Energy Efficiency across the U.S. This week, the U.S. Department of Energy (DOE) announced two new Better Buildings Accelerators, which bring together key leaders to bolster residential energy efficiency. Elevate Energy is one of several partners involved in the Home Energy Information Accelerator, which aims to make home energy information more accessible to potential home buyers. At a White House roundtable this week, Accelerator partners – including Elevate Energy, the Illinois Department of Commerce & Economic Opportunity (DCEO), and Midwest Real Estate Data (or MRED, the multiple listing service serving Chicago) – were welcomed by DOE for their commitments to advance home energy efficiency across the country. Why accelerate home energy information? The Home Energy Information Accelerator is designed to expand the availability and use of reliable home energy information at relevant points in the residential real estate process. In our experience, when homeowners make energy efficiency improvements to an existing house, these important investments are often overlooked or inaccurately valued at the time of a home sale. In both new and existing homes, it’s important to make these features visible for an entire chain of stakeholders during the real estate transaction so that energy efficient features become visible and can be accurately valued when a home is sold. Which is exactly why the Home Energy Information Accelerator is an important step toward in establishing fair value for these high performance homes. The DOE initiative brings together the disparate groups that are needed to develop, expand, and make home energy data available, including national organizations, federal agencies, and regional, state, and local leaders in real estate and energy efficiency. The Accelerator partners, including Elevate Energy, will develop and demonstrate replicable approaches to help other communities nationwide access and use home energy information. The end goal is that energy related data will become easily available to home buyers and sellers through multiple listing services (MLS) and other reports. This lays the groundwork for a virtuous cycle in which homeowners are eager to invest in energy efficiency improvements because they know that they can recover some or all of their investments at the time of the home sale. We’re honored to be a part of these efforts, and to share local successes in Chicago as a model for the Home Energy Information Accelerator. Since 2013, Chicago has allowed direct disclosure of residential energy costs (gas and electric) via the MLS when a single family or two- to four-unit home was listed for sale, the result of collaboration between the City of Chicago Office of the Mayor, MRED, and Elevate Energy. Recent analysis shows that homes that disclose energy costs have a higher close rate and spend less time on the market than comparable homes. Chicago also serves as a shining example of how distinctive groups can effectively collaborate around shared goals. For example, alongside DCEO, the Midwest Energy Efficiency Alliance, the Historic Chicago Bungalow Association, and local utilities like ComEd, Nicor, and Ameren Illinois, we’ve made the Illinois Home Performance with ENERGY STAR certification eligible for inclusion in MRED’s listings. We’re also moving the conversation forward and transforming the market through direct outreach and hands-on training with local real estate agents as part of our Value for High Performance Homes Campaign. 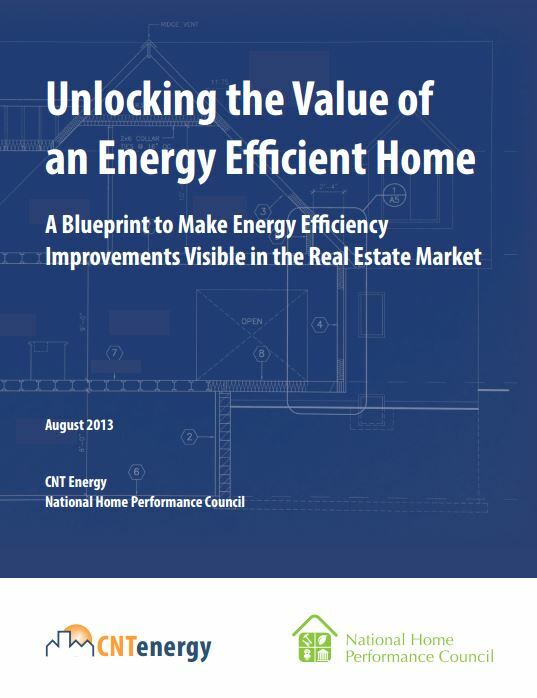 For even more on home energy data and high performance homes, be sure to read the essential blueprint from Elevate Energy and the Home Performance Coalition: Unlocking the Value of an Energy Efficient Home: A Blueprint to Make Energy Efficiency Improvements Visible in the Real Estate Market. The blueprint outlines seven steps the energy efficiency industry must take to unlock the value of efficiency in the real estate market, but others will find value in it too, including the real estate industry, energy advocates, contractors, utilities, architects and designers, verifiers and raters, building scientists, state energy offices, and nongovernmental agencies. You can also sign up for a free monthly alert and join the hundreds of other real estate and energy efficiency professionals who are staying up-to-date on news, research, tools, and case studies on home energy data in the real estate transaction. Follow the general conversation online at #VisibleValue.